Lawrence H. Schiffman, From Text to Tradition- A History of Second Temple & Rabbinic Judaism, Ktav Publishing House, Hoboken, NJ, 1991. We have already seen how difficult it had been to reestablish the Jerusalem Temple and how the Judean leaders struggled to make even a modest Temple building a reality. Over the years, various improvements were added to the Temple complex, so that by the eve of the Hellenistic reform, it had been expanded and refurbished, and had become a significant depository for the funds of both Palestinian and Diaspora Jews. Moreover, the Temple’s position on a hill overlooking the city of Jerusalem gave it great strategic value. The entire hill, the Temple Mount, was occupied by the Temple precincts, although the mountain itself was no doubt somewhat smaller than the present-day structure, which was built by King Herod. Antiochus III confirmed the Jewish law that non-Jews could enter only the outermost area of the Temple Mount. People afflicted with ritual impurities were excluded from the Temple precincts. The Temple structure was by now a complex of chambers devoted to specific purposes. 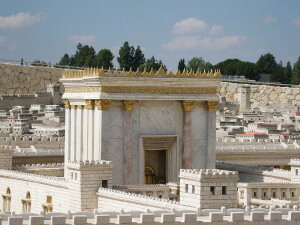 Besides the courts of women, Israelites, and priests, and the Temple building itself, including the Holy of Holies, there were dressing rooms, storage areas, and other designated rooms. A stage was used for the priestly blessing and for the levitical songs which were part of the daily rituals. 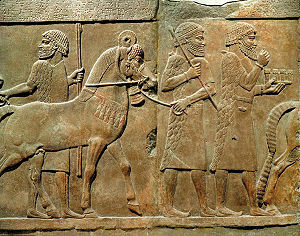 A large altar as well as special preparation areas made possible the sacrifice of animals in accord with pentateuchal legislation. The incense altar and the menorah were positioned in the priests’ courtyard. Beautiful decorations adorned the Temple. The officiants, both priests and Levites, were divided into twenty-four groups, called courses, each of which served for a week, rotating throughout the year. Each course was headed by one of its members and was, in turn, divided into subgroups. The priests sacrificed and offered the animals; the Levites assisted them and, in particular, sang psalms while the ritual took place. The laws of the Torah were strictly applied in order to guarantee the purity and sanctity of the priests, who were descendants of Aaron, the brother of Moses. The specialized vestments described in the Pentateuch were worn, and the ages of service were determined by the interpretation of the relevant biblical passages. Indeed, in most matters, the Torah and its exegesis were the authority on which decisions about sacrificial and priestly law were made. Daily services were held in accord with the prescriptions of the Torah providing for morning and late afternoon sacrifices. The biblical psalms played a prominent role in the ritual, but it is difficult to determine to what extent other prayers were recited. It seems most likely that a detailed liturgy entered the Temple worship in the Hasmonean (Maccabean) period, as will be discussed more fully in chapter 12. Various musical instruments were played by the Levites to accompany the sacrifices and the psalms. Trumpets and shofars were sounded during various rites, as commanded by the Pentateuch. Special festival sacrifices and offerings, the bringing of tithes, other emoluments, voluntary sacrifices, and atonement offerings also were part of the Temple’s regular ritual. The Torah had commanded certain priestly and levitical portions and tithes as a means of ensuring that the Temple officials would be adequately supported. These offerings were collected and distributed by the Temple administration in the early years of the Second Temple. The high priest and his officials handled the collection and disbursement of other tax moneys as well for most of the Second Temple period. Later on, however, the central collection and distribution of tithes and offerings gave way to local handling of these portions, a pattern which had probably been in effect in First Temple times.